Today, two news particularly caught my attention. The former is the imminent publication by Wikileaks of about 400,000 secret documents on the Iraq war. At the time of writing this post, the site is 'currently under scheduled maintenance', waiting to give the people of the world wide web its hottest files. Meanwhile, these people are practically clogging it of visits, despite U.S. government has prepared a task force to respond. Wikileaks also informed that the U.S. authorities have directly contributed to the blocking of donations on the site. Nevertheless, this represents an extraordinary marketing campaign for them, don’t you agree? The latter news regards Silvio Berlusconi. I refer to the last episode of Report, an indipendend Italian journalistic TV program, which recently accused Berlusconi of having illegally bought some villas in the islands of Antigua. Thanks to anticipations in many media and particularly on the brilliant threats by Niccolò Ghedini, Berlusconi’s lawyer, the TV show got audience record. Hence the dilemma: in the web time, government’s censorship is a hindrance or help? Obviously, it is a fake. However, how many would consider it likely? The News: Wikileaks, secret documents on Iraq War. The burden of proof is on you, friend... you need to show US that it's real. Incredibly low-rez, all important details are too fuzzy to be made out... and the US stopped sending telegraphs in 2006 - as did most countries except Mexico. Hey man, if this is true is an atomic bomb in Italy. Berlusconi should prepare himself to fly away. Free us from that vicious dictator. Berlusconi MUST GO TO JAIL for the rest of his life! it's 100% fake: I work for the telegram service and telegrams TO Italy get printed on the stationery of the local Post there. 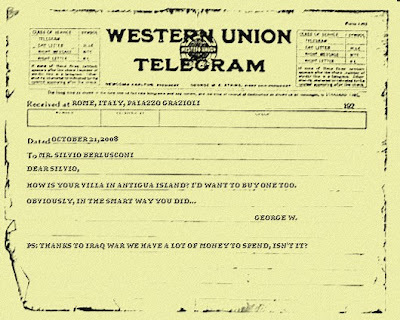 Secondly, Western Union's telegram service does not exist since 2006. Thirdly, all the telegram routing codes are not there. These are codes based on which telegraph equipment/software can see where the telegram is coming from and where it is going. These codes get printed on the telegram. ALWAYS. So it's fake, as a telegram pro I KNOW. Thank you for your comment, try to be polite, but please, if you have to spam, do not lose your time and mine. Stories and News is a magazine of in-depth analysis on current events that through stories inspired by real events tries to stimulate readers to look at the latter from other points of view. © 2008-2018 Alessandro Ghebreigziabiher. Simple theme. Powered by Blogger.